Making plans | One year, one job. 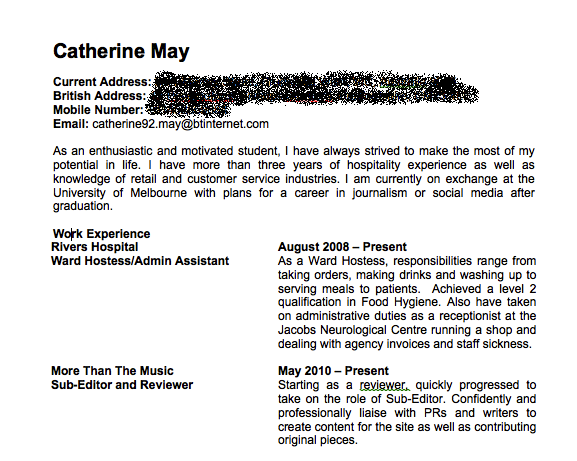 Busy updating my old CV – but what should I be applying for? What is it with me making idyllic blog plans that I can’t follow through on? Unfortunately I’ve not been able to update this blog as frequently as I’d hoped and so I’ve decided I need to make some changes. I’m putting the ‘A Closer Look’ series on hold for a while whilst I prioritise my career options. I’ve been working three jobs since returning from Australia and, regrettably, it already feels like my six months away were a lifetime ago. I will be in Manchester a week today for some training for next year’s Mancunion paper and before I know it I’ll be back up there to start my penultimate semester of University. The four days I have off each week are currently causing me some dilemmas. It’s a bit of a head versus heart battle right now – or is it a head versus head battle? Should I be financially sensible and get a part time job so I can continue earning through term time? Or should I be career-savvy and try and find myself an internship on Mondays and Fridays so I can gain vital experience in digital marketing? Or shall I go all out and seek to do both? What do you think? Is it more worthwhile to sacrifice an income to gain experience that could enhance my employment prospects after graduation? Any feedback (particularly personal experience) would be hugely appreciated. Anyway, I best get back to researching Manchester digital agencies and tidying up my CV. I’ll blog again soon.